This name comes from the Old English frigedæg, meaning the day of Frige the Anglo-Saxon form of Frigg, a West Germanic translation of Latin dies Veneris, "day (of the planet) Venus." However, in most Germanic languages the day is named after freyja—such as Frīatag in Old High German, Freitag in Modern German, Freyjudagr in Old Norse, Vrijdag in Dutch, Fredag in Swedish, Norwegian, and Danish—but Freyja and Frigg are frequently identified with each other. The word for this day in most Romance languages is derived from Latin dies Veneris, "day of Venus" (a translation of Greek Aphrodites hemera) such as vendredi in French, venerdì in Italian, viernes in Spanish, and vineri in Romanian. An exception is Portuguese, also a Romance language, which uses the word sexta-feira, meaning "sixth day of liturgical celebration", derived from the Latin "feria sexta" used in religious texts where it was not allowed to consecrate days to pagan gods. In most of the Indian languages, This day of the week is Shukravar (or a derived variation of Sukravar), named for Shukra, the Sanskrit name of the planet Venus. In other Indo-European languages the day is not related to the planet Venus. In most Slavic languages an ordinal number is used in the name for this day of the week. Similarly, the Portuguese is sexta-feira, the sixth day. A depiction of Máni, the personified moon, and his sister Sól, the personified sun, from Norse mythology (1895) by Lorenz Frølich. The English noun for this day of the week derived sometime before 1200 from monedæi, which itself developed from Old English (around 1000) mōnandæg and mōndæg (literally meaning "day of the moon"), which is cognate to other Germanic languages, including Old Frisian mōnadeig, Middle Low German and Middle Dutch mānendach (modern Dutch Maandag), Old High German mānetag (modern German Montag), and Old Norse mánadagr (Swedish and Norwegian nynorsk måndag. Danish and Norwegian bokmål mandag). The Germanic term is a Germanic interpretation of Latin lunae dies ("day of the moon"). The Russian word, eschewing pagan names, means "after holiday". In Turkish it is called "pazartesi", which means the day after Sunday. In most of the Indian Languages, the word for Monday is Somvar, with Soma being the Sanskrit name for the moon. The Japanese word is getsuyōbi (月曜日) which means day of the moon. 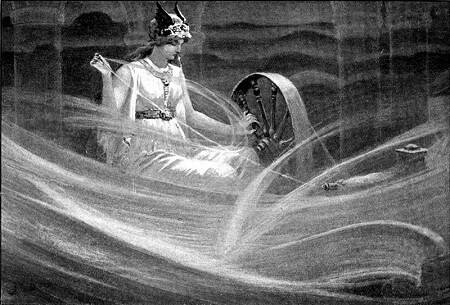 A depiction of Máni, the personified moon, and his sister Sól, the personified sun, from Norse mythology (1895) by Lorenz Frølich. The English noun for this day of the week derived sometime before 1250 from sunedai, which itself developed from Old English (before 700) Sunnandæg (literally meaning "day of the sun"), which is cognate to other Germanic languages, including Old Frisian sunnandei, Old Saxon sunnundag, Middle Dutch sonnendach (modern Dutch zondag), Old High German sunnun tag (modern German Sonntag), and Old Norse sunnudagr (Danish and Norwegian søndag, and Swedish söndag). The Germanic term is a Germanic interpretation of Latin dies solis ("day of the sun"), which is a translation of the Greek heméra helíou. In most of the Indian Languages, the word for Sunday is Ravivar, Adivar and It'var, with Adi (Ah'-Dee) or Ravi being the Sanskrit names for the Sun. The first Christian reference to Sunday is found in the First Apology of St. Justin Martyr (c. 150 AD). In a well-known passage of the Apology (Chapter 67), Justin describes the Christian custom of gathering for worship on this day. "And on the day [τῇ τοῦ ῾Ηλίου λεγομένη ἡμέρᾳ], all who live in cities or in the country gather together to one place, and the memoirs of the apostles or the writings of the prophets are read, as long as time permits . . .", he writes. Evidently Justin used the term because he was writing to a non-Christian, pagan audience. In Justin's time, Christians usually called this day the Lord's Day because they observed it as a weekly memorial of Jesus Christ's resurrection. The Roman Catholic Church believes that the resurrection of Christ occurred on the day following seventh-day Sabbath, which is Sunday, and makes it a portal to timeless eternity that transcends the seven-day weekly cycle. Acts 20:7, a passage detailing Paul and other believers meeting together to break bread and share the gospel, has been used to support the weekly meeting together on Sunday to celebrate the Eucharistic Sacrifice. In Acts 2:46, believers go from house to house breaking bread and sharing meals 'day by day'. The god Týr, identified with Mars. The name comes from Middle English Tiwesday, from Old English Tiwes dæg, named after the Nordic god Tyr, who was the approximate equivalent of the Roman war god Mars, and Greek god Ares. In Latin, it is called Martis dies which means "Mars's Day". In Romance languages the word for "Tuesday" is similar to the Latin name: mardi in French, martes in Spanish, martedì in Italian, dimarts in Catalan, and marţi in Romanian. But Portuguese, also a Romance language, uses the word terça-feira, meaning "third day of liturgical celebration", that comes from the Latin "feria tertia" used in religious texts where it was not allowed to consecrate days to pagan gods. The surviving Celtic languages preserve the Latin names, although none of these languages are descended from Latin. Tuesday is dé máirt in Irish, Meurzh in Breton, dydd Mawrth in Welsh and Dimàirt in Scottish Gaelic. The German word Dienstag, as well as Low German Dingsdag, Deensdag and Dutch Dinsdag (from the 13th century, MHG dinsdag, dinsedag, dincetag, dinstag, dingstag) is probably due to interpretation as dies judicii (thing day) or dies census in popular etymology (Grimm). Another possibility is direct derivation from the god referred to by the Romans as Mars Thingsus, the god of the Thing, who could likely be Tyr, as well. The speech of Old Bavaria, also from the 13th century, used ertag (erihtag, erehtag, erchtag, erichtag, erntag), from which Jacob Grimm in Deutsche Mythologie postulated Ear as an epithet of Ziu. In most of the Indian Languages as well as Nepali and Urdu the word for Tuesday is Mangalwar, with Mangala being the Sanskrit name for the planet Mars. The Russian word means "second"; that is, counting it as the second day of the week. The god Woden. "Odin, the Wanderer" 1886 by Georg von Rosen The name comes from the Middle English Wednes dei, which is from Old English language Wēdnes dæg, meaning the day of the English god Wodan (Woden) who was a god of the Anglo-Saxons in England until about the 7th century. 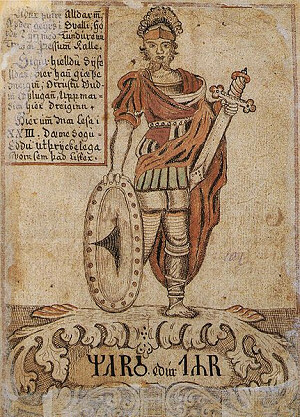 Wēdnes dæg is like the Old Norse Oðinsdagr ("Odin's day"), which is an early translation of the Latin dies Mercurii ("Mercury's day"), and reflects the widespread association of Woden with Mercury going back to Tacitus. 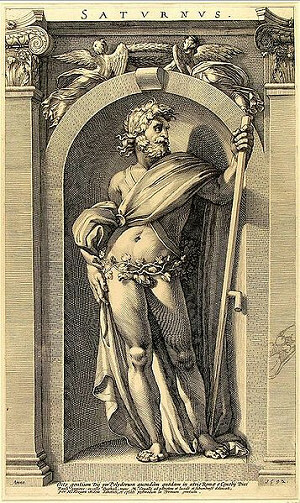 In Romance languages it is derived from the name of the Roman god Mercury: mercredi (French), mercoledì (Italian), miércoles (Spanish), miercuri (Romanian), dimecres (Catalan), dies Mercurii (Latin). Similarly, in most of the Indian Languages the name for this day, Budhavar is derived from the Vedic name for the planet, Budha (often confused with Gautama Buddha or Buddha.) Buddh is also used in Urdu. Russian does not use pagan names but instead uses the word meaning "middle," similar to the German Mittwoch. Likewise, Portuguese uses the word quarta-feira, meaning "fourth day". While in Greek the word is Tetarti(Τετάρτη) meaning simply "fourth." Similarly, Arabic أربعاء means "fourth" and Persian چهارشنبه means "fourth after Sabbath." Saturnus, Caravaggio, 16th c. It was named no later than the second century for the planet (Saturn), which controlled the first hour of that day according to Vettius Valens. The planet was named for the Roman god of agriculture Saturn. It has been called dies Saturni ("Saturn's Day"), through which form it entered into Old English as Sæternesdæg and gradually evolved into this word. It is the only day of the week in which the English name comes from Roman mythology. The English names of all of the other days of the week come from Germanic polytheism. In India, this day is Shanivar, based on Shani, the Vedic God manifested in the planet Saturn. In the Thai solar calendar of Thailand, the day is named from the Pali word for Saturn, and the color associated with it is purple. The Celtic languages also name this day for Saturn: Irish an Satharn or dia Sathuirn, Scottish Gaelic Disathairne, Welsh dydd Sadwrn, Breton Sadorn or disadorn. In Jewish Law it is the seventh day Shabbat. Thus, in many languages the day is named after the Sabbath. Eastern Orthodox churches distinguish between the Sabbath and the Lord's Day. In the Eastern Orthodox Church these days are days on which the Theotokos (Mother of God) and All Saints are commemorated. The day is also a general day of prayer for the dead, because it was on this day that Jesus lay dead in the tomb. In Scandinavian countries, it is called Lördag or Laurdag, the name being derived from the old word laugr/laug (hence Icelandic name Laugardagur), meaning bath, thus Lördag equates to bath-day. This is due to the Viking usage of bathing on these days. Today, it is officially called Samstag in all German-speaking countries, however, there are two names for this day in modern Standard German. Samstag is always used in Austria, Liechtenstein, the German speaking part of Switzerland and generally used in southern and western Germany. It derives from Old High German sambaztac, which itself derives from Greek Σάββατο, and this Greek word derives from Hebrew שבת (Shabbat). However, the current German word for sabbath is Sabbat. The second name in German is Sonnabend, which derives from Old High German sunnunaband, and is closely related to the Old English word sunnanæfen. It means literally "Sun eve", i.e. "The day before Sunday". Sonnabend is generally used in northern and eastern Germany, and was also the official name in East Germany. 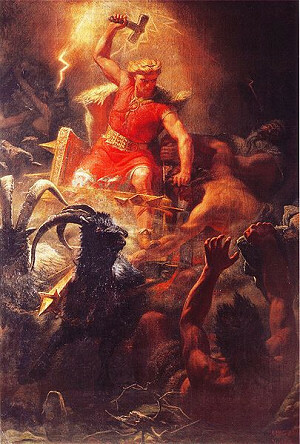 The god Thor, by Mårten Eskil Winge, 1872 The contemporary name comes from the Old English Þunresdæg (with loss of -n-, first in northern dialects, from influence of Old Norse Þorsdagr), meaning "Day of Thor". Thor was the god of thunder and so most Germanic languages name the day either after Thor (torsdag in Scandinavia) or thunder (German Donnerstag, Dutch donderdag). In Romance languages, the day is named after the Roman god, Jupiter who was the god of sky and thunder. In Latin, the day was known as Iovis Dies, "Jupiter's Day". In Latin the Genitive or possessive case of Jupiter was Iovis/Jovis and thus in most Romance languages it became the word: Italian giovedì, Spanish jueves, French jeudi, Catalan dijous, and Romanian joi. But Portuguese, also a Romance language, uses the word quinta-feira, meaning "fifth day of liturgical celebration", that comes from the Latin "feria quinta" used in religious texts where it was not allowed to consecrate days to pagan gods. In most of the Indian languages the word for Thursday is Guruvar, with Guru being the Sanskrit name for the planet Jupiter. In Slavic languages and in Chinese, this day's name is "fourth". Greek uses a number for this day: Πέμπτη Pémpti "fifth," as does Portuguese: quinta-feira "fifth day". © 1999-2017 Репетитор по английскому языку в Екатеринбурге и дизайн сайта Щербаков Ю. Н.